"A grilling recipe that is easy to prepare, tasty as a appetizer or a side dish." Whisk olive oil, sea salt, garlic, rosemary, and black pepper together in a bowl; brush evenly onto zucchini strips. Cook on preheated grill until brown, 5 to 7 minutes per side; transfer to a serving platter. Drizzle balsamic vinegar over zucchini to serve. 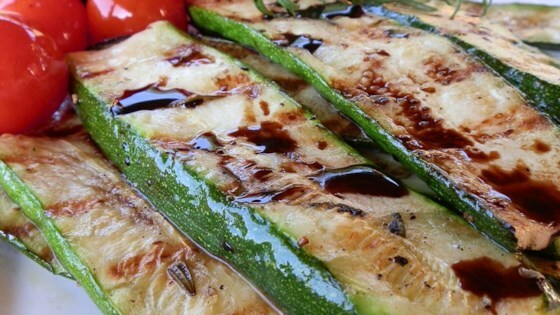 Balsamic vinegar gives grilled zucchini delicious caramelized flavors. This is by far my favorite "healthy" recipe. We double the oil mixture and spread it over sliced eggplant and have an amazing, healthy dinner, all cooked on the grill in no time! Skipped the balsamic and loved it! I like this recipe very much but with less olive oil, this recipe has way too much for me.